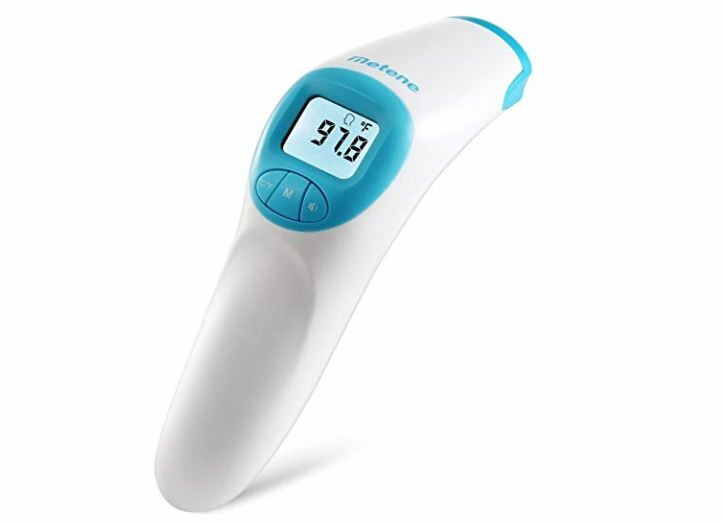 I have no clue why but I can never find a thermometer when I need one so I'm excited to get this Metene Digital Infrared Non-Contact Forehead Thermometer on sale for $12.99 (Retail $54). -Higher Accurate Reading:Enjoy Hospital Grade Accuracy at your home, clinic or workplace in confidence due to the thoroughly tested reliable of your health care thermometer.Its shape, choice of colors and its amazingly light weight speaks of artistic genius and first class design capabilities. -Easy to Use: Baby, Toddler and Child friendly quiet mode tympanic scanning with the push of a button allows you to take instant scans of infants and children without a beeping noise that may wake them. Celsius and Fahrenheit are easily and instantly switchable with an intuitive button. -Easy to Read :Temperature will be displayed on the LCD and the LCD screen with clinically proven accuracy you can rely on.the back LCD display showing you what the temperature is ,even easily readable in the dark.